The full symposium programme can be found here. "This event was unique not just for its open call, but also for the complexity of bringing so many artists and academics together from around the world under the umbrella of Grotowski and his influence and ongoing practices today. Pablo led the organisational team with his customary imagination, creative flair and organisational acumen, making sure there were rigorous debates and activities but also great fun." 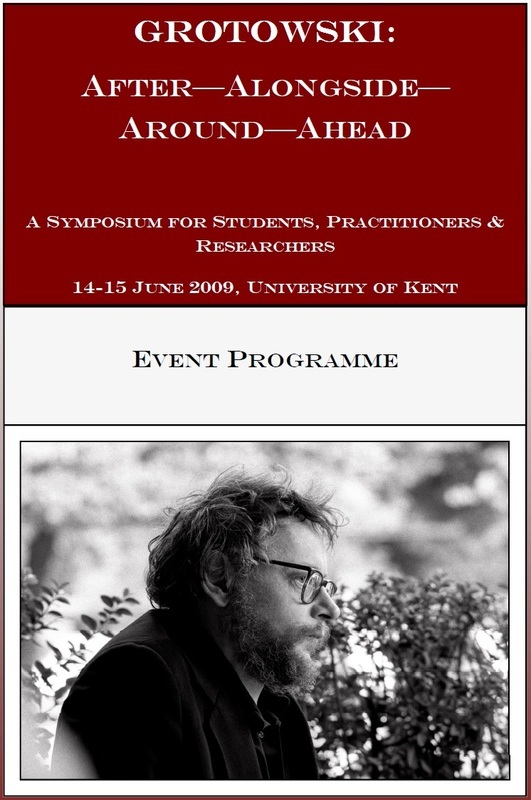 I conceived of this two day international symposium whilst working on The British Grotowski Project. It took place immediately after the project's closing conference “Grotowski: theatre and beyond” (11-14 June), and was both co-curated and co-facilitated with Adela Karsznia (Poland), Duncan Jamieson (UK), and Ben Spatz (USA). It was the only event in the Year of Grotowski 2009 programme that had issued an open call for contributions, aiming specifically at emerging researches and practitioners. The response was overwhelming and participants came from Germany, Italy, Malta, Poland, Serbia, Israel, Bulgaria, Canada, USA, India, New Zealand, as well as the UK. The symposium was comprised of 56 different contributions which included performances, work demonstrations, film and documentation screenings, seminars and academic papers. Three distinguished practitioners, theatre researches and former collaborators of Jerzy Grotowski acted as guest respondents: Jairo Cuesta, Ian Morgan, and James Slowiak. Its main aims were to provide a platform for a new generations of thinkers/makers to share and encounter each other's work within a supportive, peer group environment; as well as exploring new ways of responding to, investigating and analysing the practice of Jerzy Grotowski, his collaborators, and those inspired by their work. The event was made possible thanks to support from the University of Kent, the AHRC, the Adam Mickiewicz Institute, and the Grotowski Institute.